What fits in a Filigree? 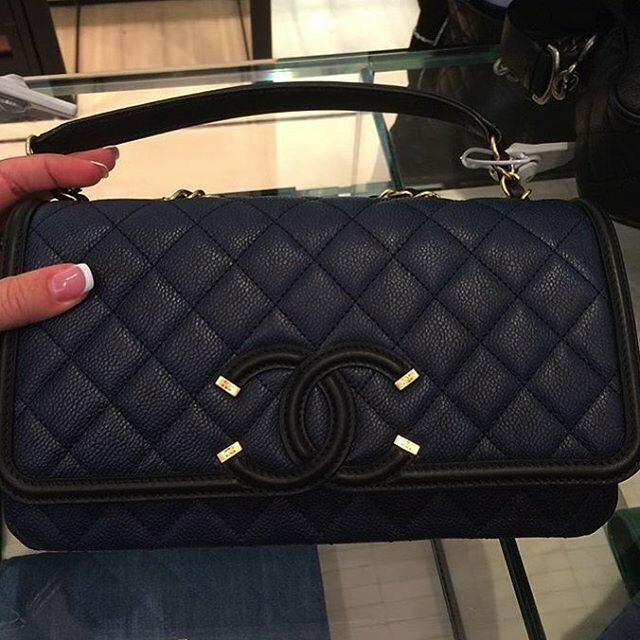 I'm new to Chanel and I'm ready to purchase my very first one. My Chanel SA just sent me a picture of this (filigree?) Can someone tell me more about it from personal experience? What you like or don't like. What fits? I have a LV Emilie wallet that I'm hoping will fit. I typically carry that, a small cosmetic pouch (LV mini pochette) and a thick card case. I'm a full time working mom, I have 2 young kids, so I imagine I'll use this bag daily going to work and night outs. Not on the weekends when I'm out with the kids. I would like to know this as well. I've tried goggling/youtubing for reviews and glimpses of the inside of this bag without any luck. Thanks! I tried that bag in reddish/orange. It's really cute and easy to wear. Don't know which size this is, but the size I tried was too small to fit all that you mentioned. It has 7 quilts along the length, I forget where I saw how that determines the size of the bag. I believe it's comparable to a medium classic flap. The one downside is that the metal loops that the straps are connected to (sides of the bags) look like they may cause stress on the leather. Anyone have problems with that? Hmm, it could prob fit...but would be tight. I have the small filigree version in blue and black. It fits more than my mini rectangle. The leather isn't as rigid so it allows you to fit a bit more. My small fits a slim wallet, phone, keys and lipgloss. I like the magnetic closure, makes it easier to get things in and out of the bag. And I like the crossbody length. I don't think you'll be able to fit a wallet and pochette in the bag though. You should check it out in the store with your items to test it out. angel9dreamer - is the picture I attached a small or medium size filigree? Following this thread as I am deciding to get the medium size filigree flap as well! The one photo you linked is the medium! 8 quilts across for medium and 6 quilts for small! I think this bag comes in different sizes with different prices. I would like to know if this bag is considered to be a classic or not? Hi. I have the medium filigree. I own five black Chanel bags and two wocs. The filigree is my most used bag! It is so easy to use and very carefree. Here are a few pics I took for you to see what fits inside. In the bag are a full sized wallet, coin purse and sunglass/eyeglass case. As you can see, there is still room to fill it to the top. I didn't add my iPhone 6 because I needed it to take the pic. HTH! Thank you for this!!!! I took the plunge and got the beige medium size as well, seems like it can fit a lot more than the classics. Your welcome! It definitely fits more than the ml flap, and I love having a single flap. Easy peasy!